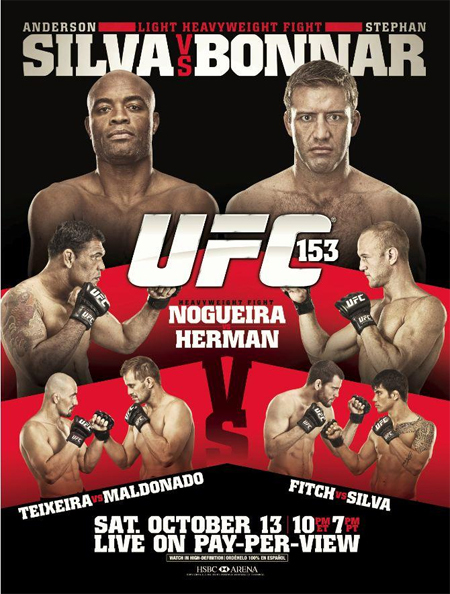 It may have taken just a simple cut and paste job to create a new event poster for UFC 153, but the card’s featured attractions underwent massive makeovers. Featherweight king Jose Aldo was forced to exit stage left with an injury, so he and opponent Frankie Edgar were replaced by middleweight champ and once-in-a-while light heavyweight Anderson Silva and Stephan Bonnar. With Quinton “Rampage” Jackson leaving the lineup via injury, Glover Teixeira now faces Fabio Maldonado but was bumped from the the co-main event. Heavyweights Dave Herman and Antonio Rodrigo Nogueira now take second-to-top billing. HSBC Arena in Rio de Janeiro, Brazil hosts the October 13th festivities.